Just outta curiosity...what are u stock/mod guys running? The same course as the Unlimiteds. There are not " bypasses ", just easier lines that may or may not be faster for some. 31's, would be interesting ? I'm worried about only having 35's and a longer wheel base. When the easy lines get plugged with cars it's going to get very interesting for us little guys ! Saw on the Campbell Racing facebook page that RCQ is on Shannon's schedule. Can anyone confirm this? What is next on the calendar for Campbell Racing? This next event is going to be a blast. It takes us back to where it all started. The FourWheeler Mags 20 yr reunion of the Top Truck Challenge. Campbell heads to the hills of Hollister in June for this grand event. I hear Woodley and crew might make an appearance. But I can't confirm just yet. When is the course map going to be made available? Do they have any appendages left?? What about Bigelow? Melchner? Rose Crawlers? Bronco Lou? Liquid Iron? last i heard Doug has been pretty busy with work.wasnt sure if he would make it or not. There's no way Bigelow is missing it. Rose Crawlers should be there. Talked to him last weekend and he said they were in. Not sure who will be driving, him or Bunny? Its mine and Kats 10 year anniversary that weekend. So your saying your going to race then go out for a nice dinner? No one is allowed on course till Friday June 1st for prerunning. No reason at all. Here is the course and this site has downloadable file types. Download to sd card then transfer to gps. There will NOT be sd card files on site for it. There were too many problems with file types and cards falling into skid plates last few years. Oh and the short course areas will be staffed or with in view of staff for the comments that always pop up about it. 14 mile lap. This message has been tested and Dave Cole approved. Last edited by JrP; 05-27-2012 at 07:36 PM. 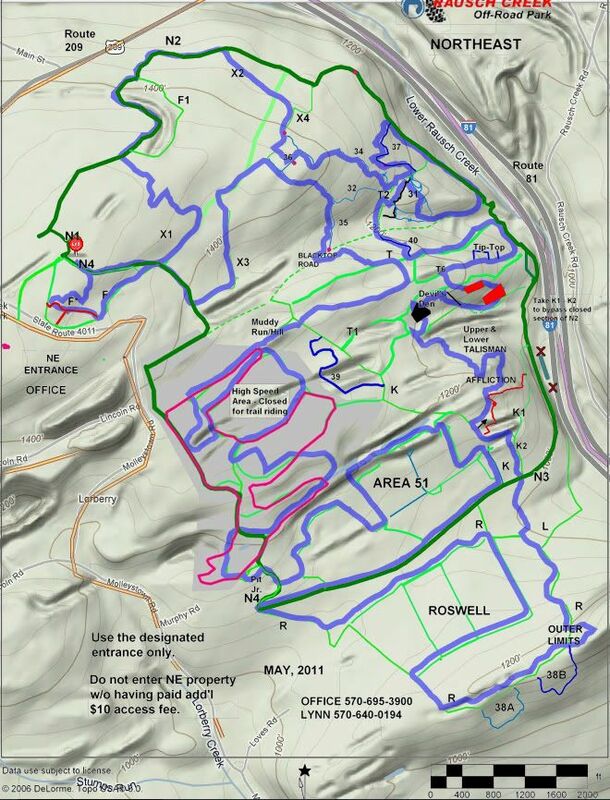 You can also view this map on an iphone or android device while at the race and use your GPS to see where you are. To do so, download the ArcGIS application for iphone, ipad or iphone. Once installed, go to the account settings (you do not need an account, but one is free), and tap on the search in the upper right (if you are looking at a map and tap that search, you will be searching the map content, not looking for a new map). In your search, simply type RCQ. Two results will come up. The one for 2012 is for this year. If anyone is interested, the course from last year is the other result. so thateveryone knows, I am currently testing an application called Racesplitter. If the testing goes well, I plan to use this for the time keeping for RCQ. For those of you at home watching, the application has the ability to publish live results to the web. I will include a link to that here if everything goes well. If anyone has experience with using racesplitter, please PM me. I am having difficulty determining how to import a start list.